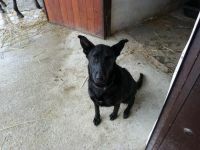 We have our own dogs, Johnny a traditional Spanish dog (Heinz 57) and Tring, a black Belgian Shepherd cross, but no cats. You are welcome to bring your own pets with you. The Campo is fantastic for walking and is perfect for dogs too. We are in the process of building a dog run complete with a cool covered area. So if you want to go out for the day without your pet you can do so knowing that your pet will be perfectly safe and secure. We are happy to feed your pets for you if you intend to have a long day out. Spanish law requires that some breeds are kept on a lead in public places.